Baroness Buscombe, the new chairman of the Press Complaints Commission, has ambitions for her organisation that go beyond the traditional newspaper companies. She wants to examine the possibility that the PCC’s role should be extended to cover the blogosphere, which is becoming an increasing source of breaking news and boasts some of the media’s highest-profile commentators, such as the political bloggers Iain Dale and Guido Fawkes. Do readers of such sites, and people mentioned on them, deserve the same rights of redress that the PCC offers in respect of newspapers and their sites? 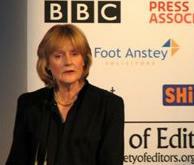 Burrell goes on to claim she said she wants to consider extending the PCC’s remit to the blogosphere. Guido thought, given he seemed to be under such dire threat that Comrade Hundal has stepped in to help with the authorities, that perhaps he should call her to find out what she was planning. You know, like a fact-checking, double sourcing thing. It turns out she has been mischeviously misquoted. Burrell has stretched her words a long way and given the impression of an intention that just isn’t there. It was suspiciously noticeable that there was no direct quote suggesting she wanted to expand the PCC into the blogosphere. Guido suggested she should perhaps put in a complaint about the Indy to herself. Her press spokesman laughed nervously.